You are here: Home / Blog / Easter Hack Ideas – Keeping it simple, yet enjoyable! I love the Easter season, but it seems to slip in there right after Spring Break and I don’t think it gets the attention it deserves in our house. So this year I am planning a little early! Thanks to the inspiration from my friend Janel over at A Moms Take, we got together to discuss some of our favorite Easter Hacks and made a video to demonstrate them. This is our first video, so expect more fun in the future and forgive my silly faces! This is a super cute and unique Easter egg hunt idea – hack your egg hunt with a checklist hunt and make the fun last a little longer. You can grab the FREE printable HERE. 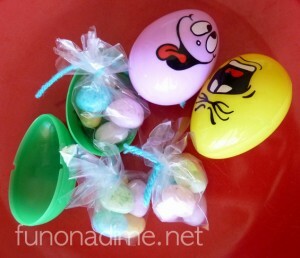 Save money on candy fillers for eggs and prevent goes candy hands by bagging them yourself – super easy! See more details HERE. DIY Tissue Paper Easter Grass! I can’t tell you how much I love this idea! You might have seen my mesmerized face in the video (My faces are so embarrassing!) I don’t know why, but I really do not like buying Easter grass, but my daughter would have so much fun creating it herself with all the tissue paper we have for crafts. AND it is super cheap! Janel also shares 50 Easter Basket Filler Ideas on her Easter Grass Tutorial HERE, too! Make a bunny from a dishtowel or washcloth for a cute gift or decoration. For some reason my kiddos love these and hang onto their bunnies all year long! Check out the full tutorial HERE for step by step pictures on how to style your bunny. I absolutely love this tip for my 3 year old. I usually avoid dyeing eggs with wee ones around, but this should still let her join in on the fun! Check it out HERE. Simple, easy and a yummy festive treat to take to your next Spring get-together. Check out the full recipe HERE. My daughter loves it when I put a wreath on the door and loves it even more when she gets to help. She came up with most of the ideas for this project and I loved how it turned out. Can you believe the flowers were made from old egg cartons?!? Check out the full tutorial HERE and learn how to make your own Egg Carton Flowers / Wreath. Make sure you send me pics if you do! Keep a look out for more ideas and share your favorite links/crafts for Easter and Spring in the comments below! I love seeing what everyone else has done! These are some very clever ideas! We’ve decided not to buy Easter decoration this year and to reuse old one and to recycle materials we already have at home for making new decoration and stuff. Mi girls are very interested of recycling right now because of school and all ideas like yours are welcome to our plan. Thanks for the inspiration! You are so very welcome! I am glad we could inspire some fun and easy ideas. My kiddos love the recycling ones the most too! We would love to see what you create. Feel free to share on our Facebook page or send us an email with pics. Happy Easter Creating!